Patrik Entian is a swedish painter,based i Norway, graduated from Trondheim Academy of Fine Arts in 2000. He completed a PhD in painting in The Norwegian Artistic Research Fellowship Programme in 2014. 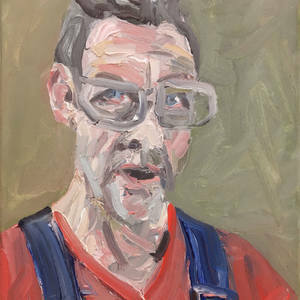 His exhibitions often take the form of installations through the way he distributes and stages his paintings in series and through a web of interconnections between the images. He has done several public comissions, and exhibits regularily. Since 2014 Entian also work in the art collaboration -& Co. together with artist Aleksi Wildhagen. In an ever on going mixture of plen-air painting, drawing, photographing, writing, filming and performance they explore their surroundings of commonplaces with careful obsevations.